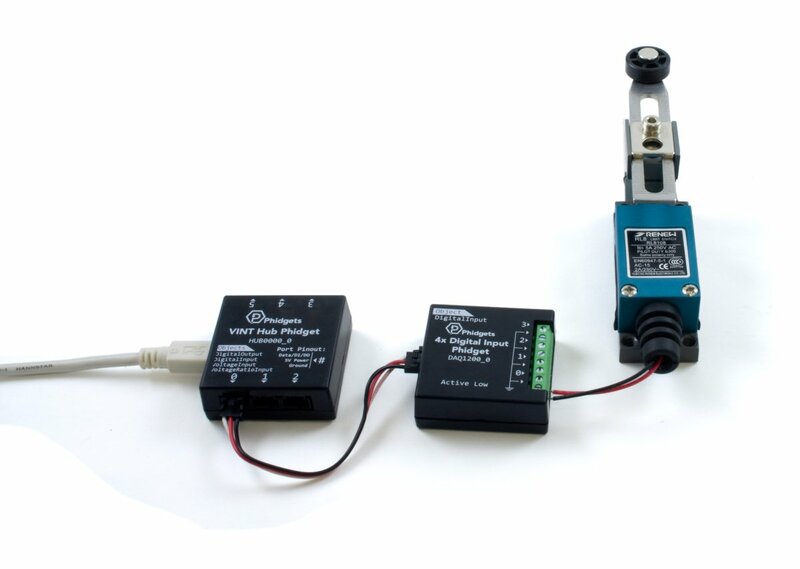 Add 4 digital inputs to your VINT Hub. These inputs have a shorter trigger time than a VINT port in Digital Input mode. 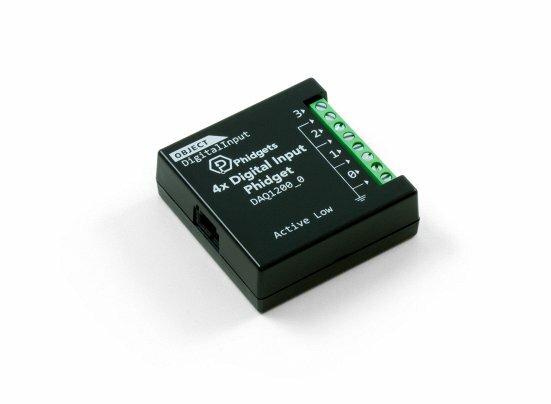 If you need to expand the number of digital inputs on your VINT Hub, this module provides four extra inputs at minimal cost. Switches, buttons, or any device with a logic-level output can be read by these inputs. The DAQ1200 connects to a port on a VINT Hub. See the Connection & Compatibility tab for a list of hubs. If you need isolation, compatibility with higher voltages, or more digital inputs per VINT port, have a look at the "Other Digital Inputs" tab for more options. 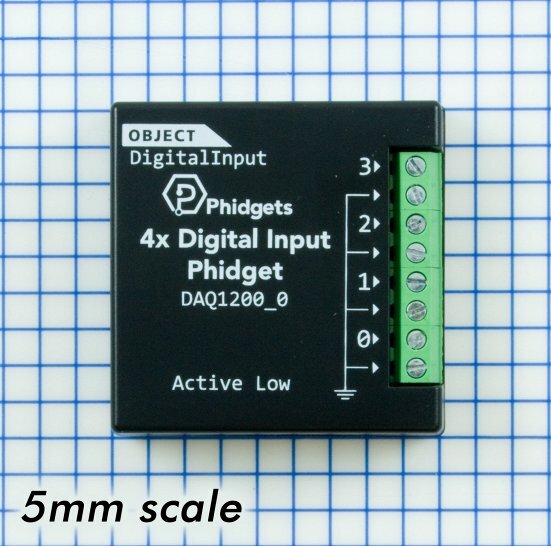 If you plan on counting pulses on a high-frequency signal (faster than 500 Hz) or to measure pulses shorter than 2ms in length, you'll want to use one of our specialized frequency counter Phidgets instead. 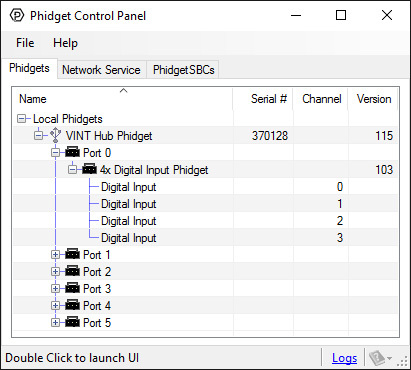 Connect the DAQ1200 to the VINT Hub using the Phidget cable. Connect a switch or digital sensor to one of the DAQ1200's inputs. Now that you have everything together, let's start using the DAQ1200!. 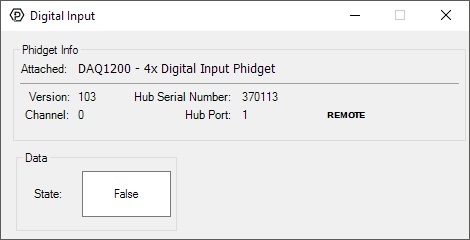 In order to demonstrate the functionality of the DAQ1200, the Phidget Control Panel running on a Windows machine will be used. Linux users can follow the getting started with Linux guide and continue reading here for more information about the DAQ1200. The DAQ1200 features four digital input terminals, all of which share a common ground. 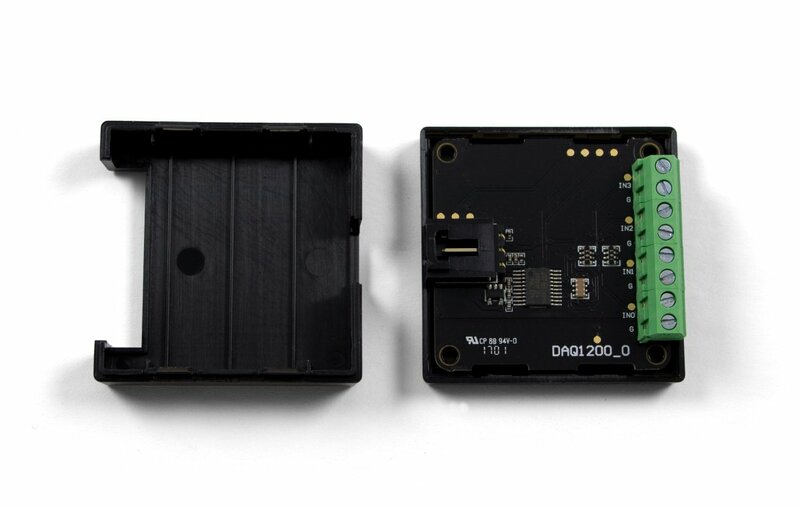 Each input has a built-in pull-up resistor to allow for easy interfacing to all manner of switches. To interface a switch with the DAQ1200, simply connect the switch across the input and ground terminals for a channel. 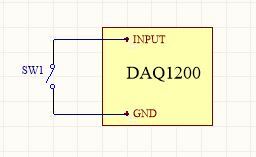 The DAQ1200 can also detect signals from 5V logic level devices. Be aware that the input is active-low, which means that LOW voltages will be detected as TRUE, and HIGH voltages as FALSE. In some applications, particularly where there is a lot of electrical noise (automotive), or where you want maximum protection of the circuitry (interactive installations, kiosks), electrical isolation buys you a huge margin of protection. If wired according to the diagram, driving the LED will cause the DAQ1200 to report TRUE. Note that in cases where many isolated inputs are required, or for simplicity's sake, you may want to consider using the DAQ1300 or DAQ1301, which are (more sophisticated) ready-made isolated digital input Phidgets. * Note: Current consumption is equal to 27µA plus 500µA for each digital input that is grounded.